Overgrown trees aren’t always the healthiest. If left as is, the damaged branches can spread the disease to other parts of the plant. But if you have your trees trimmed regularly, these sickly branches can be removed before they infect and kill the tree. When you mentally picture a haunted house, what comes into your mind? While the common picture would be having dead trees on the lawn, extensive trees that block the view of your house create an eerie atmosphere too. 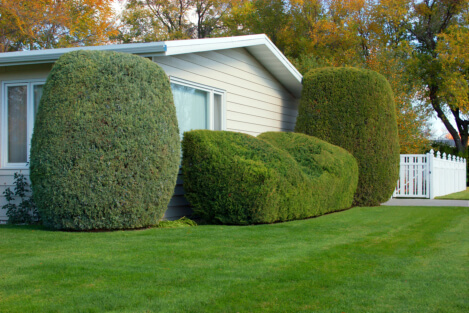 Keep your property looking nice and welcoming by having the trees in your home trimmed often. Tall trees are nice to look at. But at the event of a hurricane or a storm, they can pose quite the threat. Branches could break off and break your windows! In a difficult scenario, the tree itself can get uprooted and fall on your car or home. Or it could damage the power lines in your area. Oh no! Trees are the natural habitat of many wild creatures. However, not all of these creatures are always warm and friendly. Some of them (such as a possum or raccoon) can use the stretched out branches to crawl into your house’s windows. While they may look cute and cuddly, these are wild animals that could potentially bite and infect you with rabies. Take the safety precaution by having your trees cut regularly. Like we mentioned earlier, overgrown trees could risk damage to cars, power lines, and lead wild animals into your home. Leaving your trees to grow as they are could cause you many problems in the future. But you can clear your mind of worries from any tree problems right now. Get in touch with us at AJ Tree Service. We can expertly trim the trees in your lot and provide reliable Tree Removal and Landscaping in Broken Arrow, Oklahoma at the same time. Feel free to refer us to your friends or loved one who needs competent Tree Removal Service. This entry was posted in Professional Tree Service and tagged Landscaping, Tree Removal, Trimmed Trees. Bookmark the permalink.